Barrier Island Parks Society, BIPS, is proud to announce the opening of the historic Gasparilla Island Lighthouse! With your generous support, BIPS, a 501(c)3 nonprofit, has restored this community treasure to its 1927 splendor! All climb proceeds ensure the maintenance and operation of the lighthouse. With your generosity, we will continue to preserve this legacy for future generations. Please read through all information before reserving your climb. Cost for regular day climbs is $15 per person ($5 per child- ages 6-11) and is payable the day of the climb. Cash or check only. Checks made payable to: Light Keeper's Fund. >>> It is important that you enter an email and a telephone number when you sign up so we can communicate with you in regard to your climb. >>> Please be thoughtful of others and be on time and prepared to climb with your party as climbs are scheduled at 20-minute intervals. You must arrive 10-15 minutes prior to your climb to check in at the reservation table and to pay for your climb. We reserve the right to give away your reservation slot if you do not arrive within 5 minutes of your climb. Special Climbs are also available, see fees below. Valentine's Day Climb - Cost is $35 per person. Bring your loved one to this romantic climb. Includes non-alcoholic champagne, hors d' oeuvres, and a rose. 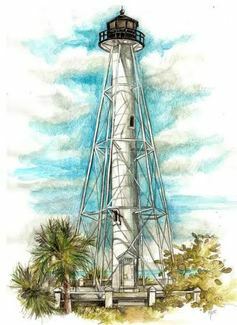 Moonlight Climb - $25 per person ($5 per child- ages 6-11) Be one of the first to climb Gasparilla Island Lighthouse in the evening during a full moon. Holiday Climb - $35 per person ($5 per child- ages 6-11). The lighthouse will be decorated with holiday lights and hot cocoa with whip cream and cookies will be served. 1. Sensible climbing shoes or sandals with straps preferred. 2. Shirts and Shorts/Pants or Swimsuit Covers Required. 3. No food, drinks, or gum. 4. No backpacks, selfie sticks, drones, or other video equipment. 5. Children must be at least 44" tall to climb. Must be accompanied by an adult for ages 15 and under. 6. No carrying children up the stairs is allowed. 7. If you are pregnant or have a heart condition, you might want to consider not climbing. 8. If you are afraid of heights, please do not climb. 9. You will not be allowed to climb if you are under the influence of alcohol or drugs. 10. BIPS staff and volunteers can refuse entry to anyone at anytime. 11. Climbs will be canceled during inclement weather. If you have any questions prior to making your reservation, please contact Barrier Island Parks Society at 941-964-0060.